Welcome to this weeks steal their style, looking at my top celebrity outfits that they have been seen out in recently and how to mimic their styles for less. Sorry for the lack of a post yesterday, so I hope that this post makes up for it! Let me know if you see any of your favourite celebrity pictures and would want me to try and find a dupe outfit for them. I have been a huge fan of Adriana Lima since back she was the face of Maybelline a few years ago. Earlier this week she was seen out and about in this outfit. I really adore the maxi skirt and the great use of a simple white tank top. The most expensive part of this outfit was the leather jacket and I do admit I had some issues trying to find a very similar skirt for a decent price. This is personally my favourite outfit of the two, the moment I saw this floral silhouette dress I fell in love with it. 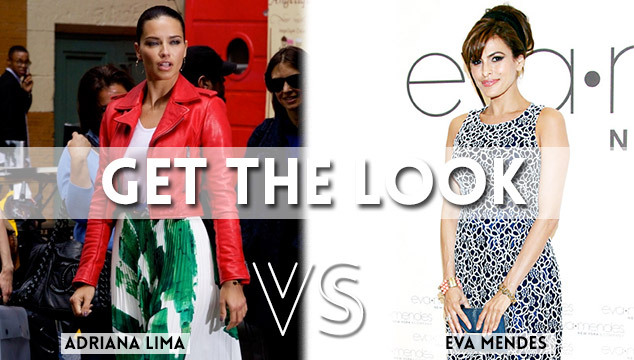 I have always been a huge fan of Eva Mendes, she is such a beautiful lady and I love her understated style. It is also probably one of the closes matches I’ve managed to find so far for steal their style and overall I am really happy with this recreated look. Thank you for reading this weeks steal their style, let me know what your favourite outfit was and if you see any photographs of celebrities out and about that you would like me to find their styles for less for next weeks post. Please tweet and share on Facebook with anyone you think might enjoy this post.